Oil exports have long driven the economies of the United Arab Emirates, but the region is additionally characterized by rapid expansion in the finance, retail and tourism sectors. The resulting population boom in the UAE’s urban centers has put great pressure on municipal utilities. Large-scale expansions to municipal wastewater treatment systems have ensued, and with those expansions come the risk of the release of foul odors. An existing treatment system consisting of chemical scrubbers controlled hydrogen sulfide (H2S) odors emitted from the Al Wathba 2 Wastewater Treatment Plant, part of a larger wastewater collection and treatment system serving Abu Dhabi and its surroundings. The system is massive, treating 85 million gallons of wastewater each day. When plants process such high volumes, the amount of chemicals required to treat the resulting odors is very high. These chemicals are quite costly while also posing safety risks to the workers who must handle them. Plant leaders decided to explore alternative treatment systems that would eliminate the recurring high cost of treatment chemicals. A detailed exploration of the site by BioAir specialists revealed that odors could be satisfactorily controlled by installing a biological odor control system. It also confirmed what the plant’s operators had assumed: Switching to a biological treatment system as proposed by BioAir would result in incredible cost savings. 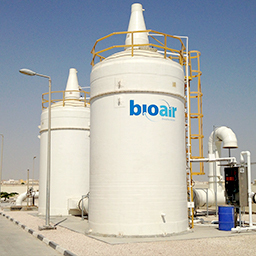 BioAir Solutions designed a high-volume treatment system that collected odorous air from numerous locations around the plant and treated them in a centralized location. The system replaced the site’s existing chemical treatment scheme. The system includes eight EcoFilter® biotrickling filter units featuring BioAir’s patented EcoBase® structured synthetic media. You can learn more about breakthrough biotrickling odor control technology in our article on biological H2S removal. The treatment system is one of our largest, treating air volumes of 150,000 cubic meters per hour, or 88,300 cubic feet per minute. In fact, the only system comparable in size to the Al Wathba 2 treatment system sits just 1,200 feet to the north. We also built the treatment system at the STEP PS01 pumping station—the largest municipal pumping station in the world. See the odor and emission control systems we customize to your site and its unique challenges. The eight EcoFilter units installed at Al Wathba 2 are over 99% effective, according to post-startup data. In fact, the systems work so well that the plant’s entire odor load was effectively treated without the need for secondary chemical polishing starting just four days after installation. What’s more, compared to the recurring cost of treatment chemicals, Al Wathba 2 WWTP’s multi-million dollar investment in the BioAir treatment system paid itself off in just two years. Our work at Al Wathba 2 shows that biological odor treatment eliminates odors in the highest-volume settings, cuts costs for WWTP operators and preserves the quality of life for those living, working or traveling nearby. An on-site evaluation from BioAir process experts is the first step to solving your odor challenge, whether your current odor control system is failing or an expansion to your site requires an expansion to your treatment capacity. If you want more in-depth information about odor and emission control, read our introductory guide to industrial odor control.